Get exciting discounts on advance bookings. Book your stay for extended periods and get amazing discounts. Quintessentially a traditional Indian brand in its DNA, The Clarks Group of Hotels is one of the Leading Hotel Groups in India, recognized throughout the nation for its unique flavor of hospitality and finesse. The Clarks Group boasts of being one of the first 5 star hotels in India. Clarks firmly believe in sustainable luxury, adopting eco-friendly ways and sustainable energy that can be adopted by the hospitality industry. With 5-star business and leisure hotels in the city of Jaipur, Lucknow, Agra, and Khajuraho, Clarks offers its guests sustainable luxury, efficient services and amenities and a touch of heritage with an assurance of high levels of quality. Our service philosophy at the Clarks Group of Hotels is driven by an understanding of the importance of guest needs and an eye for detail across all services. The Hotels feature rooms & suites & penthouses, meeting rooms, restaurants, lounges, spa, business centers and a health club providing the right blend of service, functionality, and luxury. Clarks Amer, the first 5 star hotel in the Pink City of Jaipur is located in a green residential area. Located on the prestigious JLN Marg, Clarks Amer is just a 5 minutes' drive from the Jaipur International Airport and a 15 minutes' drive from major city attractions such as City Palace, Birla Mandir, Jantar Mantar and Hawa Mahal. Built on an expanse sprawling more than 18 acres of nature's bounty, Clarks Khajuraho is the first 5-star hotel in Khajuraho. Located near the Khajuraho 9th century temples and heritage sites, Clarks Khajuraho is a 10 minutes’ drive from the Khajuraho Airport and a 15 minutes’ drive from the Khajuraho Railway Station. 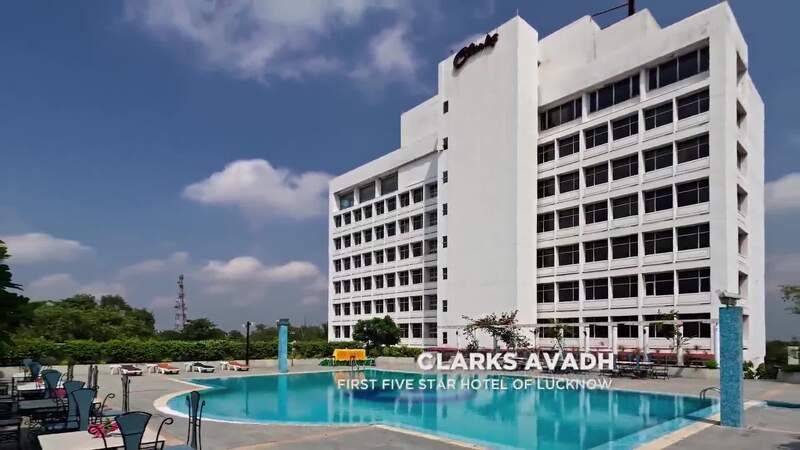 Situated near the Gomti River, Clarks Lucknow is the 5 star hotel in the city of Lucknow. Located in Hazratganj- the shopping hub of Lucknow, Clarks Lucknow is a 25 minutes’ drive from the Lucknow Airport and the Lucknow Railway Station. Clarks Lucknow is in the centre of the recreation hubs in the city of Nawabs. At Clarks, we have a proud history of organizing the best events and destination wedding experiences in the country. At Clarks, we provide the most glorious venues in Jaipur, utmost care and convenience to perfectly complement your celebrations.